Syrian UN envoy denounces Cabinet meeting on Golan Heights, calls on Security Council to get involved against Israel. Syria's envoy to the United Nations on Monday denounced as "provocative" an unprecedented Israeli Cabinet meeting held in the Golan Heights on Sunday, which the Jewish state liberated and annexed decades ago. "It is an irresponsible provocation committed by Binyamin Netanyahu, the prime minister of the Israeli occupation force," Bashar al-Jaafari said of Sunday's cabinet meeting, which was the first ever to be held in the area liberated in the 1967 Six Day War, when Israel miraculously fended off Syria and other attacking Arab armies. Jaafari, who is also the head of Syria's delegation at peace talks set to resume Monday in Geneva, said his government would send letters of protest to the UN secretary general and the Security Council. The letters, he told a Geneva news conference, urge the Security Council and the secretary general "to condemn immediately the (Israeli Golan Cabinet) meeting and demand that it is not repeated." Jaafari said that he told the UN envoy to Syria, Staffan de Mistura, that "the Syrian Arab Republic has the right to take back the Golan...by all the legal means guaranteed under the UN charter." His talk of legal means comes a day after Syrian Deputy Foreign Minister Faisal Al-Mekdad on Sunday threatened to "retake the Golan Heights by any means necessary, including using military force." 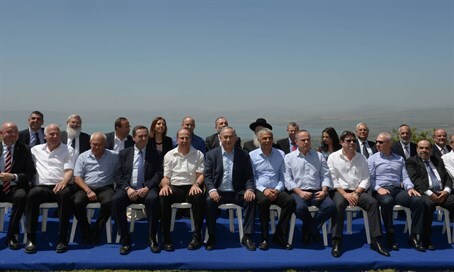 In his comments in the Cabinet meeting, Netanyahu emphasized that "the Golan Heights will always remain under Israeli control. Israel will never withdraw from the Golan Heights." He called on the international community to recognize two things, firstly that "no matter what happens across the border, the (border) line itself will not change. Second, after 50 years the time has come for the international community to finally recognize that the Golan will always remain under Israeli sovereignty."